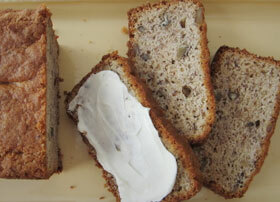 Easy banana bread that can be made dairy free too. Just substitute the yogurt or sour cream with a dairy free one. Make a parchment or foil sling and place in the 8×4 loaf pan or grease well. Set aside. Use an electric hand mixer and beat the sugar and shortening together. Mix in the yogurt, vanilla and egg together. Stir in the bananas (make sure you squished then real good). Place all the dry stuff in another bowl and whisk to combine (we don’t want baking powder blobs in our bread). Stir in to the banana batter and then stir in the nuts. Pour into your pan. Bake for 50 minutes or until a toothpick in the center comes out clean. Let it cool for 10 to 15 minutes. Then pull on the parchment sling and pop it out or turn upside down and rap hard to pop out. Will keep fresh, tightly wrapped, for 4 days out on the counter. You can freeze it forever, almost. If you want to make muffins, just line 12-16 muffin cups with papers. Use a cookie scoop or a spoon and fill the muffins cups about 3/4 full. Bake at 350 degrees for about 20 to 25 minutes. The muffins are done when a toothpick inserted int he center comes out clean. If you liked this recipe please buy our cookbook : Gluten Free Yeast Free Breads. There are many other recipes just like it in this cookbook. And it helps to keep up going baking up new recipe for you to enjoy.